Revival :: noun :: A restoration to bodily or mental vigor, to life or consciousness, or to sporting success. Are you ready to shake off the winter doldrums and be REVIVED??? This winter was grueling and seemed to drag on forever! As Spring FINALLY arrives in Chicago, we are all ready to re-emerge from our various states of hibernation. We are ready to open our hearts, minds and bodies again to all the divine possibilities that exist for us as individuals and as community. In times past (and still in some parts of the US), folks gathered under big tents in open areas to experience a return to what they believed in. To be moved and spiritually touched by divine energy and possibility. They showed up to be healed and to bear witness to the healing of their neighbors and community. They gathered in droves, excited to witness a demonstration of healing that would re-inspire their faith. Tickets for this inspired event are $55 before May 7th. $65 thereafter. Thaddeus Tukes is an accomplished Vibraphonist and composer who will provide the perfect ethereal soundtrack for our REVIVAL! 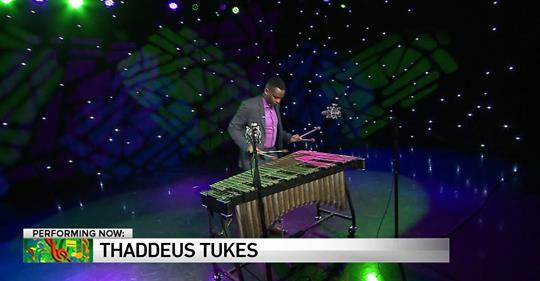 Click the link below to experience a preview of Thad’s music recorded live on WGN. The Haji Reiki Healers are a magical cohort of Empresses who will bless us with divine Reiki energy throughout the restorative yoga practice. Once guests lie down for Nidra (guided relaxation) they will each experience what our grandmother’s used to call “the laying on of hands” a 3-5min relaxing transfer of Reiki energy direct from the practitioner. Meet Angelana Grant, Courtney Smith and Mayda Del Valle!